Remember browsing through Your Sinclair / Sinclair User and Crash mags doing some Type-Ins at home with them laid in front of you! Remember screaming at the Telly when they wouldn't run!! NOW you can have all that again! 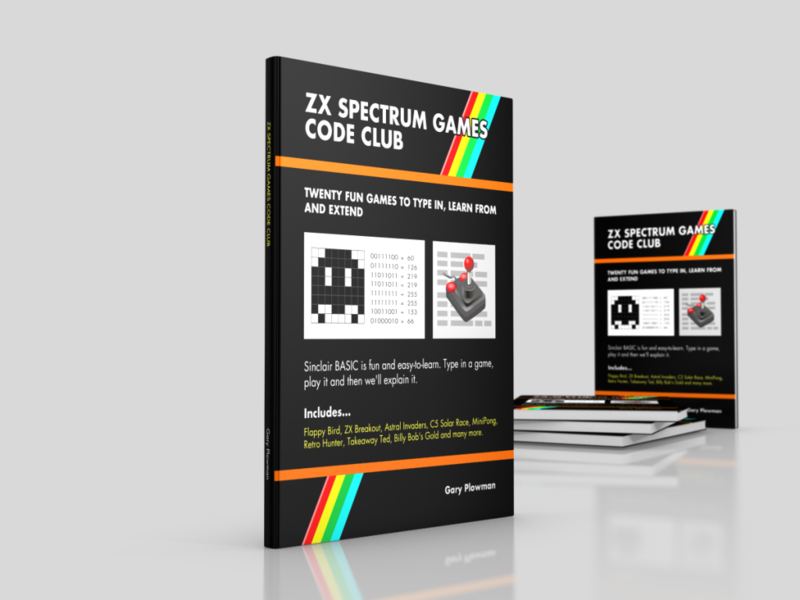 I am releasing a Kindle and Printed Book of Twenty of my own Type-In Listings of 1 and 2 player games aim at getting people coding and aimed at younger Code Clubs too. This is about fun and Game Making! So don't expect a manual on Sinclair BASIC...However, I will explain the complicated bits...Binary / UDGs / Arrays etc. Last edited by Gary Plowman on Tue Oct 04, 2016 11:26 am, edited 5 times in total. Brilliant - though I think I spent enough hours of my youth typing in listings already. Are these new or from back in the day? Covering easy game making concepts and some intro into speccy graphics and UDGs - How to do Binary etc. Timothy Redux wrote: Brilliant - though I think I spent enough hours of my youth typing in listings already. Are these new or from back in the day? Oh god that takes me back. I used to faff about in BASIC a lot back in the day. Working out the totals for each row on user defined graphics. Crikey. I used to be quite good at that given that I was young. The only magazine type-in that I liked playing was Portals of P'thaal or something. I don't think I ever did them from the magazines, but I did get a couple of type-in books from the local library and tried them out! They could frustrating at times. I had did a couple for the C64. 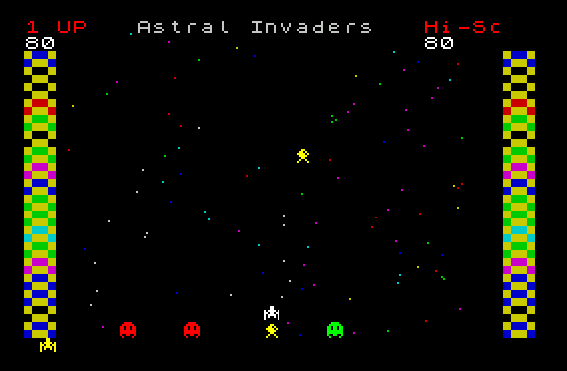 There was a sort of Moon Lander game in BASIC - and that took forever to get right from the type-in. You also had to remember to save! Not only did you have to pretty much debug the listings yourself (not so easy when it had a massive chunk of machine code in it, as some listings seemed to be), but I often wound up changing stuff in the listings to see how the program would react to the different code. It put me in good stead a college - I wound up using a few routines that nobody else on the course knew about during the course - once I'd worked out the relevant commands in COBOL and PASCAL. I must've been the only person that set up the program to scan the keyboard buffer for keypresses (naturally with a "Press any key to continue" prompt") rather than everyone else in the course using an INPUT command with "Press Enter to continue" prompt. It actually surprised the lecturers as they didn't even know the technique I'd used for scanning the keyboard buffer until they read my listings. I guess it was just the kind of thing they'd not come across at that point. I had a book full of Atari 8-bit type-in adventures. The trouble was that most of them were fairly simple and you could tell what you had to do to complete the adventure while you were typing it in! Then there was the joy of receiving a similar book from a (well-meaning but IT-clueless) relative at Christmas/birthday for the wrong platform and you had to try and convert the code on the fly. Would never work unless it was simple BASIC. But yes, they were a miracle if they ever worked! Had a few books with type in listings for the oric -1, spectrum and c64. They always had a program titled Biorhythms didn't they and never mind about tape loading errors for games; type ins always had a bug somewhere that rendered your hard work a waste of time. I'm pretty sure you could have taken the faulty book back to WH Smiths and asked for your money back! I suppose half the fun was working out why it didn't work though. Maybe they should bring the type in listing back like they do with those model car kit magazines. I can see it now. Type in the listing for Fallout V. Each month we will release code for you to type in and build up your game from scratch. In two years you will have a completed game with each part as a library for you to collect! Approximately ten billion aeons ago me and my mate spent an entire night typing in a listing on the Spectrum. My memory is a bit hazy but I think it was in Popular Computing Weekly or something with a similar name. It wasn't your typical Speccy type-in. It was a mystery game and it was all just numbers that you typed in. We were drooling considerably over how awesome this machine code mystery game was going to be. We visualised a decent take on Jetpac, maybe a secret level for Manic Miner. The power of machine code would deliver. It took us nearly all night. When we ran the program the words "The Fall And Rise Of Idi Amin" appeared on the screen. Then, with our young and innocent hearts sinking fast, we watched the screen clear and the words "Idi Amin" go from the bottom of the screen to the top of the screen and back down again. There was a brief pause and then the Speccy reset and our hard and totally pointless work was gone. Whenever I feel a developer or coder is getting too much stick for the work they've done I remember this type-in to lessen my pity. Yes I have memories of Type-Ins! They could be great fun or hair pullingly frustrating! Will have to check these new versions out! I too learnt a lot from typing in listings.